In an image viewer application it may be useful to display a list of image thumbnails. Also, one may need to display a list of images into a list control or a list view. Displaying the images in a list control inside a dialog box or a CFormView-derived class may be somehow easier to implement, since a CListCtrl-derived object can be used, but displaying it in a CListView-derived class is not so obvious, because we cannot use our own CListCtrl-derived class into a CListView (there are some articles describing this issue: How do I use a derived CListCtrl with a CListView, and Using derived CListCtrl in CListView - Undocumented ). The solution presented in this article uses a JPEG reader class (Class library for image file decoding ) to read JPEG images and display them into a CListCtrl. The idea is to create an image list that holds the icons created from the JPEG thumbails. The first problem arises with the fact that MFC class CImageList does not support higher color depths than 16 colors (4 bits per pixel). Another interesting issue is that image loading takes quite some time. This article addresses both these issues. 1. Creating an image list with higher color depth. The less-known SDK macro ImageList_Create meets this problem. Adding items to the list control is quite simple if we are not writing a time-critical application. 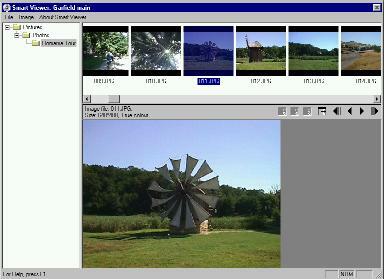 If there is a great number of thumbnails to load, the user will see just a moving scroll bar flashing on the screen while the images are being loaded from disk. Instead we can use a simple thread mechanism to add the list items while another thread just loads the images, and all this while the user continues to interact with the application. // is the file name valid ? The code uses SDK semaphores, pipes and threads because they are easier to handle and much straightforward than MFC threads and synchronization mechanisms. There is also a piece of code took from the article Creating a bitmap object from a BMP file and adapted to work with data returned by the PaintLib image handling library. The code is quite easy to follow and change to meet your needs, but if you need assistance, contact me. Also please send me bugs or updates, to keep this solution up-to-date. For more details on the sample application, contact me.